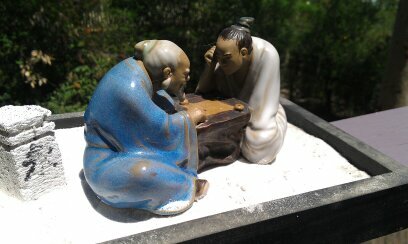 In Japan, two sensei, one in white and the other in blue, sat down to play checkers. Mount Fuji was in the background and they were bored because that was what they did every day. “Let’s go fishing’, said the one in blue. They caught two big fish and they ate them for lunch. Instead of being bored, they were happy and full. It’s lovely layout Peter. The image is perfect and hopefully Sonya will show Dardo who is looking forward to seeing it.